Energy derived from the wind offers a viable alternative to traditional power sources. Coming from a 100 percent renewable source, wind power will play an increasingly important part in the future. 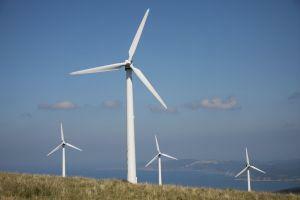 The turbines that are used to create the energy are often sited together and are called wind farms. A wind farm is a group of wind turbines that are grouped together to produce electricity. They vary in size and can range from one or two turbines providing energy for a small rural village, through to large wind farms spread over hundreds of acres providing energy for a much wider area. An added benefit to wind farms is that the land where the turbines are located can also be used for crops and livestock. The first wind farm was installed in southern New Hampshire in 1980. It consisted of twelve 30 kilowatt turbines located across a series of connected ridge lines. Some of the largest wind farms in the world are located in the United States. Most are located in mountainous areas to take advantage of the winds that blow over the ridges. As it comes over the ridge it accelerates in speed, creating more energy. Each unit of energy which is generated on a wind farm saves the same amount generated from fossil fuels. This helps top reduce greenhouse gasses and pollutants significantly. The Buffalo Mountain Wind Energy Facility in Tennessee consist of 18 turbines. These have a total capacity of 29MW which creates enough energy to power 3,800 homes.That power is clean and does not harm the environment. Some wind farms are located off shore on oceans as well as lakes. These take advantage of the constant ocean winds. Belgium had 51 percent growth in offshore wind farms in 2010. Denmark established the first offshore wind farm in the world in 1999. As of 2013, the country had 868 megawatts of offshore capacity with plans to expand capacity to 1268 megawatts. Germany plans to have 10,000 megawatts-worth of offshore wind turbines attached to the energy grid by 2020. Ireland and the UK are working together to create offshore wind farms and thus creating over 60,000 new job. The turbines that are placed off shore are more desirable in many ways than the wind farm that is on land. Turbines can be noisy and when they are on land they can disturb local residents as well as ruin the view of an otherwise beautiful landscape. Also, since the average wind speed is higher over open water, due to minimal surface roughness in the water, the utilization rates are higher than for onshore farms. There is also a benefit to marine life as the piles and foundations used for the turbines become sort of a man made reef providing increased habitat and food for sea life. While most people agree that wind energy is a good idea there are, like anything else, pros and cons. One of the biggest benefits of a wind farm is that it is a clean energy source and has very little negative impact on the environment. It does not lead to pollution in the environment, not does it encourage global warming. According to the California Energy Commission energy can be produced for as little as $.07 KWh and even less with modern technology. It does not require another source of fuel to create it. Wind farms can be located off shore in areas that would otherwise be unusable. Small turbines can be used to power individual homes and small businesses. Turbines can be noisy and bother nearby residents. According to the American Bird Conservancy, wind farms can be dangerous to birds, both in terms of collisions and loss of habitat. The turbines are not beautiful to look at and can mar the scenery. Totally dependent on the wind and therefore the amount of energy produced is not consistent. Daniel Kirk-Davidoff, professor of Atmospheric and Oceanic Science at the University of Maryland, warns that wind farms could create micro-climatic changes in the areas where they are located. Some people believe that wind farms lower property values. Many wind farms are open to the public or offer tours. This can be an excellent chance to observe wind farms in action and form your own conclusions about how they affect the environment. American Wind Power Center and Museum in Lubbock, Texas and Huron Wind Farm located in Ontario, are two of the many available in North America. Three of the many international wind farms that are available for tours are Codrington Wind Farm located in Australia, Woolnorth Wind Farm in Tasmania, and Swaffham Ecotech Centre in the United Kingdom. Generally, a phone call to a local wind farm is all that it takes to arrange a tour. It is important that people know all of the facts about wind farms and other types of power so that they can make informed decisions about the best alternative energy solutions. A wind farm in the planning stages can be halted or held up for years because of public outcry. When assessing the pros and cons of a local wind farm, the impact of the current power method on the local environment should be taken into consideration. Generally, a wind farm will be more beneficial than other possible forms of energy.